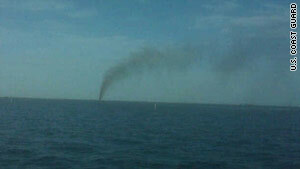 Smoke billows from a wellhead after a towing vessel struck it off the southeastern Louisiana coast Tuesday. NEW: Spokesman for Louisiana governor says the well was abandoned, declared "orphaned"
New Orleans, Louisiana (CNN) -- A towing vessel struck an oil well in the Barataria Waterway off the southeastern Louisiana coast on Tuesday, causing the well to emit oil and natural gas into Barataria Bay, the Coast Guard said in a news release. Retired Coast Guard Adm. Thad Allen, the government's point man for the oil spill in the Gulf of Mexico, said there was a sheen around the platform, and vapor that's probably a combination of gas and water was emanating from the well, called C-117. Kyle Plotkin, a spokesman for Gov. Bobby Jindal, described the well as "orphaned." He said it had been owned by Cedyco Corp. of Houston but was declared abandoned by the state in November 2008. Plotkin said the state does not own the well and added that the designation does not absolve Cedyco of responsibility for the well. The tug vessel Pere Ana C was pushing the dredge barge Captain Buford Berry when it hit the wellhead, the Coast Guard said. Jindal and Coast Guard Rear Adm. Paul Zukunft, the federal on-scene coordinator for the Gulf spill, and other officials surveyed the damage by helicopter, according to a statement from the governor's office. Video: A new leak in the Gulf? "The Coast Guard's overflight this morning confirmed the pipeline/well-head is discharging a mist of orange and brown oil about 100 feet in air," Jindal said. "This is the same thing we viewed on our flight to the well today. The Coast Guard does not have a specific flow rate for the well determined yet, although there have been early reports that there is natural gas and mud mixed in with oil coming from the well." Jefferson Parish Councilman Chris Roberts said that while oil was gushing from the well in 6 feet of water, it was too dangerous to get close enough to estimate how much oil was leaking out. However, Roberts said he doesn't "expect it is going to be a huge problem to contain it or cap" the leak, because "it isn't uncommon." "Until we know the condition of it, the quickness of plugging the well is uncertain," said Capt. Ed Cubanski, chief of incident management for the Coast Guard's Eighth District in New Orleans. The Coast Guard has tapped the Oil Spill Liability Trust Fund, which the federal government makes available for natural resource damage assessments. Environmental Safety and Health personnel were on the scene to clean up, as well as the Coast Guard Gulf Strike Team from Mobile, Alabama. Allen said response crews were able to take advantage of the "significant resources" -- vessels of opportunity, skimming equipment and boom -- already in the area to work on the Gulf oil spill. He said C-117 was surrounded by boom. "The Coast Guard is also beginning oil spill response actions at the site -- deploying hard and sorbent boom both north and south of the oil release," Jindal said. "Air assets have also been deployed to ensure response personnel are not working in a flammable atmosphere. Once the leak source is secured, the Coast Guard will ramp up their skimming operations to collect free-floating oil. "We know this well is close to important marshes in the Barataria Bay area, so it is important that this well is cut off quickly and the oil is contained and removed," he said. A safety zone has been established 2 miles around the site to protect vessels and mariners from the hazards associated with the release, the Coast Guard said. The Coast Guard is investigating the incident, which happened about 1 a.m. Tuesday.